It's been years, probably decades, since I last saw the Alvin Ailey American Dance Theater perform. No particular reason-mostly timing conflicts, I suspect. This year the stars aligned, and I had the good fortune to be part of the Seattle audience during Ailey's 2014 Spring tour. Not only was this performance an opportunity to watch some amazing dancers; it was also a thought-provoking experience. More about that second point in a bit. The tour was more of a marathon: more than 20 cities over a couple of months. I believe Seattle was the 18th or 19th stop. The dancers didn't betray any particular exhaustion onstage. If anything, the adoration lavished on them by the capacity audience surely buoyed the performers' spirits. We were treated to three works. Ronald K. Brown's 2013 "Four Corners" opened the Saturday evening show. Almost a dozen dancers (the women in flowing dresses and head scarves, the men in loose trousers and shirts) undulated across the floor to a musical pastiche. At times the dance felt vaguely African, but what was most remarkable was the dancers' prowess. Brown required of them a technical control that was breathtaking. Bent at the waist, arms extended, the dancers drew up through their backs, forming arches that they then mimicked with their arms and hands. They shimmied and shook, following the ebb and flow of the music. The dance ends with a line of dancers snaking out, one by one, from the wings, moving upstage, then back downstage and off. The movements passed from dancer to dancer down the line, like a relay runner passes a baton. The men, in particular, shone. Alas for the audience, the program offered us no photos, so it was hard to pick out our favorites by name. One man stood out for me. A bit of detective work identified him, I think, as Yannick Lebrun. He launched himself into each movement with his full being, exuding a sort of radiance that separated himself from his colleagues. "Four Corners" left me breathless, both in empathetic response to the nonstop energy of the performers, but also with respect to the scope and ambition of the choreography. in Ohad Naharin's "Minus 16"
After a short intermission, the show resumed with Israeli choreographer Ohad Naharin's high voltage 1999 work "Minus 16." I've seen Naharin's company, Batsheva Dance, perform this; the Ailey dancers were equally impressive. "Minus 16" began with a disarming front-of-curtain solo. Marcus Jarrell Willis stood, looking out at the audience, dressed in a dark suit, white button down shirt and dark lace-up shoes. The house lights remained up as Willis' elastic body seemed to collapse in on itself, then spring upright in one swooping movement. Willis never stopped regarding the audience regarding him, as he dropped down and slid across the stage floor, to end up, prone with his chin propped on his fists. The house lights slowly faded, and the stage erupted in a frenzy of music and movement, as 20 more dancers in suits and matching hats joined Willis. "Minus 16" is more than a single dance: it's like a cavalcade of insistent energetic dances. Each is distinct, yet tied into the whole. Even a bittersweet pas de deux, a momentary lull in the action, was super charged. The hullabaloo culminated with an extended section that included the audience. Artists have broken the fourth wall before, but "Minus 16" heaves a load of TNT at it, smashing through with gusto. 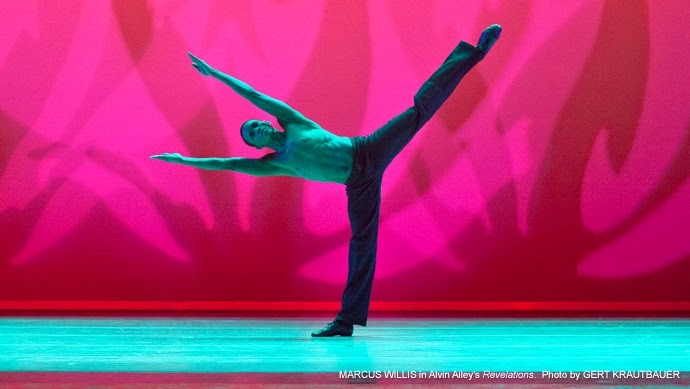 Marcus Jarrell Willis in "Revelations"
The evening ended, as do most Ailey company tour performances, with Alvin Ailey's seminal 1960 dance "Revelations." And this is when my brain went into overdrive. Because "Revelations" is more than a dance; it's more than a tradition. Built in three sections, "Revelations" is steeped in a sensibility that comes out of Texas-reared Ailey's life, as well as the wider African American experience. From the exhaustion and torment of oppression, to anger and struggle, to a joyous affirmation of what it means to be alive, "Revelations" is an impressive work of art. But watching the audience response, it was clear that, to them, this was far more than a piece of choreography well executed. I needed to know more. Choreographer and former Ailey student Donald Byrd graciously sat down with me to give me to talk about this. Byrd grew up in the Deep South, and he says as a young man he had a visceral negative reaction to spirituals (the soundtrack of "Revelations"), because they reminded him of slavery, a chapter of his heritage he preferred not to dwell on. When he left Florida to study in the Northeast, Byrd was a voracious consumer of dance performance. He says he went to see everything. On the recommendation of Tufts University classmate William Hurt, Byrd attended an Alvin Ailey performance. He says as "Revelations" ended, he was surprised to find himself on his feet, cheering with tears running down his cheeks. It was a personal and artistic revelation: Byrd told me he thought at the time "I want to make art that makes people feel like this." Since those school days, Byrd has maintained a long and evolving relationship with Alvin Ailey American Dance Theater: he studied there, caught Ailey's eye, choreographed for both Ailey II and the main company. In particular, Byrd's dance "Shards" drew national acclaim. It was Alvin Ailey who, personally, validated Byrd's choreographic aspirations, his artistic sensibility, despite the fact that the younger man was more interested in New York's downtown, avant garde dance scene. It's clear that the 2014 Seattle audience felt much the way Donald Byrd did more than 20 years ago: Alvin Ailey American Dance Theater is, for them, as much a symbol as an artistic institution. As such, it bears a weighty responsibility. Byrd says he believes the new Artistic Director Robert Battle wants to bring more contemporary dance pieces into the Ailey repertoire. But it's a delicate balance: too much new work overshadows the company legacy; too little relegates it to museum-status. And, it turns out, on these marathon cross-country tours, we audiences in the hinterlands are not exposed to the full artistic cornucopia that Ailey offers. For that, Donald Byrd says, I have to travel to New York in December. The information you have posted is very useful.This survival motion picture stars Jesse Eisenberg, Woody Harrison, and Emma Stone to watch on vioozfreemovie.com. Bodies Moving In Space: Is That All There Is?